RUSH: A great See, I Told You So about Michelle Obama, who’s back. Moochelle (My Belle) was on Ellen DeGeneres show saying she has once again lost all hope. No! No, no. “All we have is hope.” “All we have is hope.” It used to be “all we need is love.” But now “all we have is hope.” That’s how bad things are. Mrs. Obama, do you ever ask yourself a question: If your husband and you and your administration were so appreciated and so loved and so widely supported, how the hell did Hillary lose? Hmm? If the nation really wanted the Barack Obama agenda, then how did it lose? Because Hillary promised to continue it, and your husband, Michelle, was out there campaigning basically saying if you want more of what I have given you, you need to vote for her. And what happened? So this presumption that the country is totally in love with Obama, supporting of Obama, wants more of the Obama agenda, it’s just not born out by any evidence at all. RUSH: I want to take you back to Inauguration Day, January 23rd, 2017, about 53 weeks ago. And during this inauguration, the day begins after morning prayer with the president-elect arriving at the White House with the first lady. And they go inside where the outgoing president and first lady pour them a cup of coffee and they talk about whatever. It is a very short, perfunctory thing. And then they all leave and go up to the capitol for the inauguration itself. 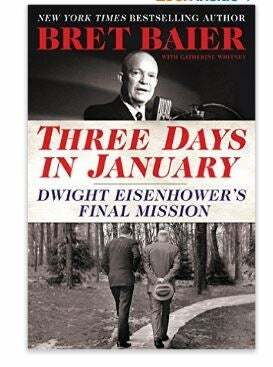 We know Bret Baier had a book on Ike, Eisenhower, that Eisenhower, they drove up there, but Eisenhower didn’t go in. He hated Truman. Eisenhower just stayed in the car while somebody poured coffee for somebody inside the White House. Well, when the Trumps arrived, the gracious and lovely Melania Trump held in her hand a gift for Michelle (My Belle) Obama. And it had the color, the distinct color of a box from Tiffany, which of course is right down the escalator from the gilded penthouse where the Trumps live. And Melania Trump presented this gift to Michelle Obama, who looked like she’d be handed a vial of the flu virus. She barely reached out to accept it and then looked around perplexed as though, “What’s this? What am I supposed to do with this?” What this is is another bit of evidence that I know these people, that you should not doubt me when I explain liberals and how they live and how they behave. Let’s go back and listen to my original observations after having watched this on the morning of January 23rd, 2017. RUSH ARCHIVE: So Melania gives Michelle the box. And Michelle stands there holding it in both hands, kind of like looking around like, “What is this? What do I do with this?” She tries to give it to an aide to take because she wants her hands free. There were some still-shot photos from that video taken, and I’m reading my tech blogs about this Friday night. 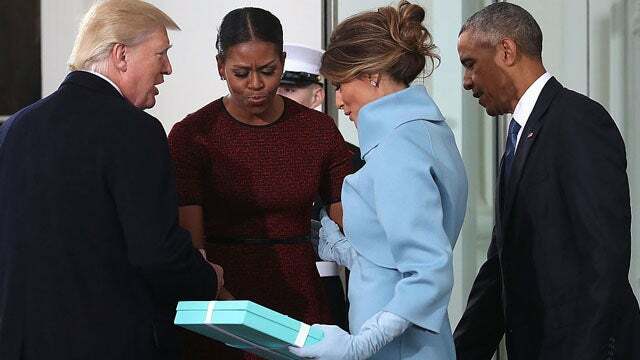 And they’re making fun of Melania for having the audacity to give Michelle something from Tiffany, and they think Michelle is the greatest in the world because of this expression of disdain on her face. “All we have is hope,” she said in a preview clip from the Ellen show. “People are afraid, but then there are people who feel good about the direction of the country, so I mean, that’s what makes this country complicated because it’s made up of so many different people from different backgrounds.” The world is a scary place, and all we have now is hope. Do they wonder why they lost? If they were so adored — if their policies, if their agenda was so appreciated, if the American people were so enamored of it and they wanted more and more of it — then why did not Hillary win? Because Obama was campaigning for her. (That’s probably why.) He was, and he was essentially saying, “If you want this to continue, you gotta vote for her.” Remember the Democrat convention? Obama’s up there on the stage. He looks at Bill Clinton who is in the audience and says (impression), “Bill, you know what? “May not want to admit it, but she better than either of us. She’ll be a better president! She’s gonna be better either of us were, Bill.” You know, Bill had nod his head in agreement or else, you know, the Energizer Bunny might be sent home from Chappaqua. How ridiculous was that? Here’s a woman that failed her first time, she’s botched pretty much every political thing she touched, and here’s Obama telling the nation she’s gonna be a better president than either of them? And you know he doesn’t believe it, because in Obama’s mind nobody could be a better president than he was. RUSH: Did I not nail this? She looked at it, the box. She doesn’t want it. She doesn’t know what it’s for. It’s a violation of protocol! “Somebody being nice? Why, this doesn’t compute,” and it was treated like a live hand grenade. “Here, Barack, take this! Take it.” He took it. He saved the day — saved the day by taking the box inside and they cleared everybody out. This was such a diversion. Just amazing. So, my friends, yet again, do not doubt me. RUSH: Okay. Grab sound bite 21 and we’ll head… (thump) Oops! A screw loose here, folks. In the mic boom, not with me. There you go. After this, we’re gonna grab our first call of the day from somewhere — parts unknown — in Virginia. Here is Michelle Obama answering the question from Ellen DeGeneres, “I personally feel frightened. I’m frightened. I’m scared. I feel like the world’s a very scary place right now. What is your take on what’s happening? MICHELLE: People are afraid. But then there are people who feel good about the direction of the country. Umm, so, I mean, that’s what makes this country complicated, because it’s made up of so many different people from different backgrounds. The thing I learned in the eight years that I was in the White House was that what we do every day in our lives, the good things that we do every day — and we know we do it. We show empathy. We care for each other. You know, we do have a lot in common. That’s what it means to lead with hope and not fear — and that’s all we have is hope. RUSH: There you go. (chuckles) Look, if I challenge this, the left will say, “Have you not got any soul whatsoever? What is wrong with what she said?” Nothing’s wrong with it. It’s just classic liberalism. (interpretation) “Life is a struggle. Life is to be overcome! We have to show empathy. We have to care for each other. We do have a lot in common. That’s what it means to lead with hope.” None of that matters. That’s just… That’s more of the gobbledygook. “Here’s what’s wrong with America. This is what we need to do to fix it. America’s the problem, America has not enough love, not enough diversity, not enough in common,” blah, blah. Anyway, to the phones we go. Parts unknown in Virginia. This is Rebecca. You’re first today. It’s great to have you. How are you doing? CALLER: I’m just fine. How are you? RUSH: Good! Good, good, good. Thank you. CALLER: I am calling to comment on the Melania Trump “gift-giving gaffe” as it was called on Vogue.com yesterday. Vogue which, you know, is a fashion magazine, and is supposed to be the arbiter of class and style and whatnot picked up the quote from Michelle Obama on the Ellen DeGeneres show where she stated that she was completely perplexed and offended and otherwise befuddled by Melania’s gesture. To me, that just shows how lacking in class and everything the Obamas really are, and it’s spreading like wildfire. I mean, there’s no civility left in our society. RUSH: Well, you know, there are gonna be some people who think that may be a bit extreme, that it shows they have no class. But it’s clearly… Something like that, to me, I have to tell you: The fact that it was offensive, and now that it’s something to mock Melania Trump about? CALLER: I mean, if someone gives you a box from Tiffany’s, you say, “Thank you.” (laughing) That’s what you do. RUSH: Instead, it’s treated like it’s an insult. It’s like a gauche, unsophisticated move. “Who does she think she is giving me something?” It didn’t compute. CALLER: At Vogue.com, it was on their… I don’t know what you call the first page of the website. RUSH: Home page. You call it “the home page.” I’m glad you went there because I would never know what’s in Vogue unless somebody like you told me. CALLER: — and he’s spreading the good word throughout elementary school. RUSH: Well, we are always appreciative of that, and we would never mock you and make fun of you and act offended after you told us something like that. We would appreciate that. CALLER: Just say, “Thank you.” But we’d like for you to write some more, and quickly, because we’ve read them all. RUSH: (laughing) Many more and quickly. Okay. I’ll put it in the hopper. CALLER: Okay. Thank you. I listen to you every day. RUSH: Rebecca, I’m glad you do. I can’t tell you how happy that makes me. I appreciate it. That’s right. Just say, “Thank you,” and move on. Say, “Thank you,” and give it to an aide. If you don’t want it, give it to the usher. If you don’t want it, send it over to the Obama presidential library or something. But then to describe this thing as something we’ve gotta take inside? “My husband saved the day! He grabbed the box. We took it inside; we cleared the staff out.” What does that mean? Before opening it? Well, they’re acting like they thought it was something incendiary. I don’t… She said that it shows how “classless” the Obamas are. Maybe. I think it shows something else. It’s another sign of the deep divide. Because, folks, it wasn’t just Michelle Obama. Remember, what made me even mention this was I’m reading my little tech bloggers, and they loved how rude she was. And they thought it was the stupidest thing in the world for the incoming first lady to give the outgoing a gift. And I literally was perplexed reading this. And I’m asking, “When did all this hate start? What’s its origin?” To me, it’s just an example of the unbridgeable gap. RUSH: I think it was just rude. I mean, when you get right down to it, it’s just rude. The Obamas acted rudely.